First Industrial Revolution - The first wave of the Industrial Revolution lasted from the late 1700s to the mid-1800s. It industrialized the manufacture of textiles and began the move of production from homes to factories. Steam power and the cotton gin played an important role in this period. Second Industrial Revolution - The next wave took place from the mid-1800s to the early 1900s. During this phase large factories and companies began to use more technologies to mass produce goods. Important innovations during this period include the use of electricity, the production line, and the Bessemer steel process. When did it start in the United States? The early part of the Industrial Revolution in the United States took place in the northeast in the New England region. 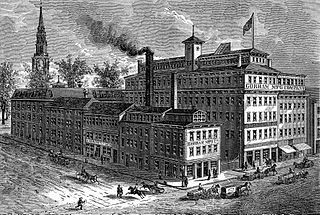 Many historians place the start of the Industrial Revolution with the opening of Slater's Mill in 1793 in Pawtucket, Rhode Island. Samuel Slater had learned about textile mills growing up in England and brought his knowledge to the United States. By the end of the 1800s, the United States had become the most industrialized nation in the world. The Industrial Revolution brought about many cultural changes. Before the revolution, most people lived in the country and worked on farms. During the revolution, people moved to the cities to work in factories. Cities grew and became overcrowded, unsanitary, and polluted. In many cities, poor workers lived in crowded and unsafe buildings. This was a dramatic shift in the way of life for the average person. Transportation changed dramatically throughout the Industrial Revolution. Where before people traveled by horse, walking, or boat; new ways of travel were introduced including railroads, steam boats, and automobiles. This changed the way people and products were able to travel around the country and the world. One drawback of the Industrial Revolution was poor working conditions for people in factories. There were few laws to protect workers at the time and working conditions were often dangerous. People often had to work long hours and child labor was a common practice. By the end of the 1900s, labor unions and new laws began to create a safer working environment. Many early factories were powered by water so they had to be by a river that could turn the waterwheel. A group of weavers in Britian who lost their jobs to large factories began to fight back by rioting and destroying machinery. They became known as Luddites after one of their leaders Ned Ludd. Printers were able to use steam power to print newspapers and books cheaply. This helped more people get the news and learn how to read. Some of the most important American inventions during the Industrial Revolution included the telegraph, the sewing machine, telephone, cotton gin, the practical light bulb, and vulcanized rubber. Manchester, England was the center of the textile industry during the Industrial Revolution. It earned the nickname "Cottonopolis."